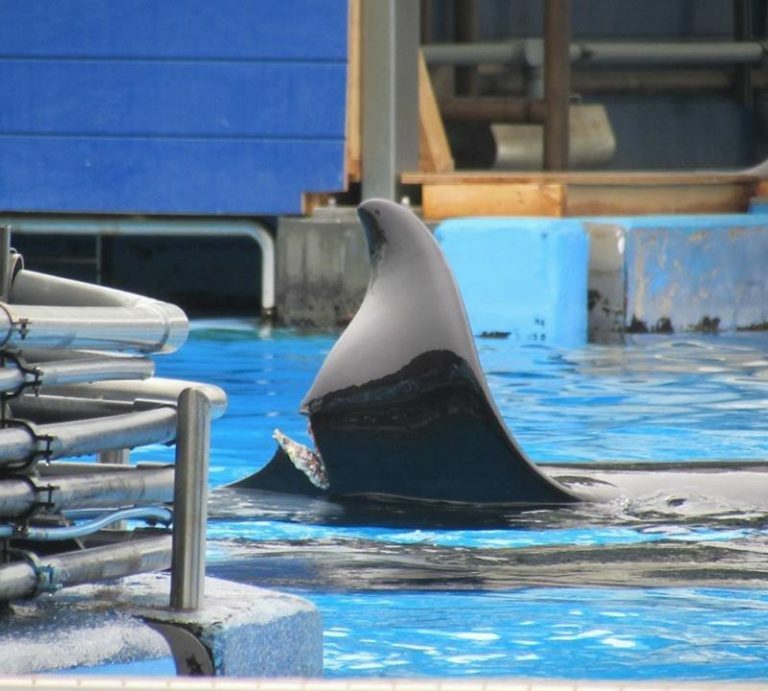 Katina, a captive orca living at SeaWorld Orlando, was recently photographed with a horrific-looking injury — the backside of her dorsal fin has been cut open and bears a long, deep gash. On Saturday, photographer Heather Murphy entered SeaWorld Orlando after hearing rumors about Katina’s injury. Katina is not currently performing in shows, but she’s still being kept in a tank within public view, and Murphy was able to capture several photos of Katina’s injury with a zoom lens. When The Dodo contacted SeaWorld Orlando about Katina’s injury, a spokesperson for the park referred to a recent blog post — in it, the park claims not to know how Katina got hurt, but mentions that she’d been interacting with other orcas, including a 12-year-old male named Trua. The injury actually occurred on March 17, but SeaWorld waited for two weeks to announce it. However, Naomi Rose, a marine mammal scientist at the Animal Welfare Institute (AWI), doesn’t understand how SeaWorld Orlando wouldn’t know the exact nature of Katina’s wound. Even though SeaWorld Orlando won’t provide an exact reason for Katina’s injury, the park insinuates that it may have been caused by Katina’s tankmates’ aggressive behavior. The park also suggests that this kind of behavior is “natural,” and that Katina’s injury would have also occurred in the wild. Yet Rose disagrees, arguing that she’s never seen an injury like Katina’s amongst wild orcas. Violence among SeaWorld’s animals wouldn’t be anything new. Former employees have witnessed extreme aggression between SeaWorld’s orcas, including ripping strips of skin off each other with their teeth. Countless orcas have been spotted with bite marks or bleeding from other injuries. In 2016, a young orca at Spain’s Loro Parque was filmed repeatedly pulling herself out of her tank to escape bullying by her SeaWorld-born tankmates. Still others have injured themselves trying to escape the aggression. Heather Rally, a marine mammal veterinarian who currently works with the PETA Foundation, also disagrees that wild orcas would inflict this kind of injury to each other. Katina currently shares a small tank with several other orcas, including two of her own offspring, and this would be incredibly stressful for all of the animals, she explained. Besides the gash, Katina has a collapsed dorsal fin, which is something that frequently happens to captive orcas as a result of poor health and stress. And Katina, who is about 42 years old, has plenty of reasons to be stressed out. In 1972, Katina was captured from the ocean off the coast of Iceland, and since then, she’s been living in tiny, shallow tanks at SeaWorld Orlando, where she’s forced to perform in shows for human entertainment. She’s had seven calves in captivity, including Kalina, who was the original baby Shamu. Katina was even bred with her own son, Taku, to produce Nalani — something that’s “taboo” in wild orca populations. In the wild, female orcas can live up to 100 years, but they have much shorter lives in captivity — many die when they’re only in their 20s. While Katina has lived much longer than other captive orcas, Rally fears for her future well-being, and believes that she should be moved to an ocean sanctuary. “Her life depends on whether or not this serious wound heals,” Rally said. “[We are] once again calling on SeaWorld to send the orcas to seaside sanctuaries, where they may live safer, more natural lives,” Rally said.